Once upon a time my mom would make a Humble Berry Pie, at least that's what she called it. It was usually a combination of mixed berries, mostly raspberries, blackberries and, her favorite berry of all, Boysenberries. I loved this pie but it always came with her standard lecture about humility. We got pie but we had to be humble to eat it. I was willing to be humble long enough to eat my piece of pie, then I reverted back to being the cocky little brat that was my norm. Now, there is a real, historical humble pie (not a berry in it though) and the word “humble” itself comes from the Middle French word “nomble,” which translates to “scrap." The humble pie of history was a Medieval savory dish servants made from the scraps of the master’s table, topped off with a crust and baked up as a pie. I guess the masters didn't leave too many berries on the table. How berries ended up in mom's pie is something she took to the great beyond. Sadly, I never though to ask her. Though there is an old country saying to “eat humble pie”, meaning cockiness gets its comeuppance, and my mom was quite fond of that saying, as well as berries. She even passed both tendencies down to me, but did not pass her pie baking abilities down with them. My cockiness is probably why the pie gods have cursed me with the inability to make a decent pie. Nope, can't bake a good, homemade pie to save my un-humble self which is probably why I have created so many pie cocktails. So, no successful baking of my mom's Humble Berry Pie for me. But the booze gods love me. 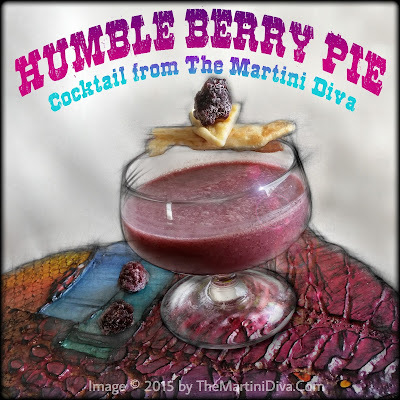 In fact they have blessed me with the talent of turning culinary chaos into cocktail creativity, thus my mom's Humble Berry Pie lives on as a very delicious (and dare I say Un-Humble?) drink! Add all the ingredients to your blender and pulse until nice and smooth. Pour your chilled coupe glass. Garnish with the pie crust and berries. But be humble about it. 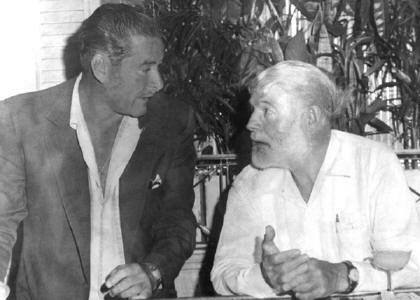 You might think the margarita is the favorite drink of Mexico, but that isn't the case. When you go out drinking with the locals it's not a margarita they order but a Paloma. Margaritas are for the tourists. Now there's nothing wrong with a Margarita, in fact, I love them, but when in Rome - or Mexico in this case - you should always try to drink what the locals drink. It's not only polite, it broadens your happy hour horizons. 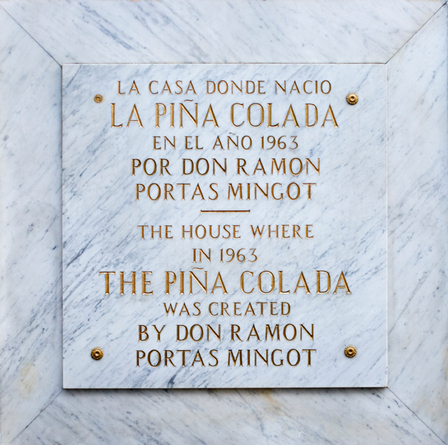 Paloma means "dove” in Spanish and it's said that creator Don Javier Delgado Corona, owner of La Capilla in Tequila, Mexico, named the cocktail after a popular song of the same name. I don't know if this is true, I wasn't there, but I don't really care. All I really care about is whether the drink tastes good and the Paloma does. 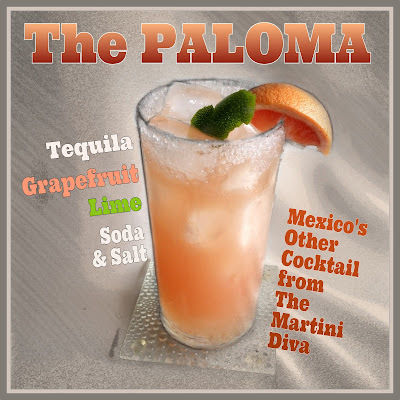 Often made with Jarritos, a grapefruit-flavored soda found all over Mexico, I personally think the Paloma is best made with fresh grapefruit juice and I happened to have several nice grapefruits given to me by a friend who grows his own. They were really small, and kind of ugly, but their juice was sweet and pink and delicious. I immediately decided the Paloma was the way to go and so ... I went. Add some grapefruit juice to a saucer, in another saucer combine one tablespoon of the sea salt and one tablespoon of sugar. Dip the rim of your glass in the grapefruit juice and then into the sugar and salt combination. Combine the tequila, lime juice, agave syrup and salt in your highball glass. 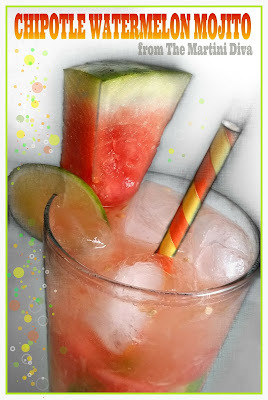 Add the grapefruit juice, stir then top off with the soda. Stir again, gently, then garnish a grapefruit slice and a twist of lime. Enjoy - like I did! NOTE: Please be aware that grapefruit juice can have negative interactions with certain medications. 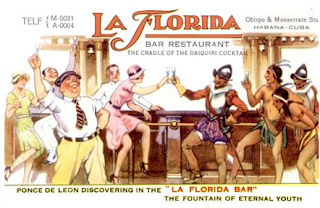 "... a group of American engineers who had come into town from the Daiquiri mines were imbibing their favorite drink in this restful spot. 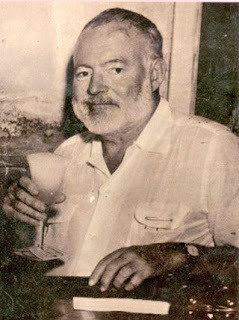 It was one of those wonderful rum concoctions made from Ron Bacardi. A jovial fellow by the name of [Jennings] Cox spoke up. ‘Caballeros y amigos, we have been enjoying this delicious mixture for some time, but strange to admit the drink has no name. 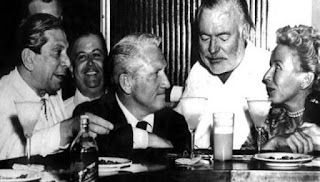 Don’t you think it is about time something was done to extricate us from this sad predicament?’ It was unanimously agreed that the drink should be named, without further procrastination. There was silence for several minutes as each man became immersed in deep thought. Suddenly, Cox’s voice was heard again, 'I have it, men! 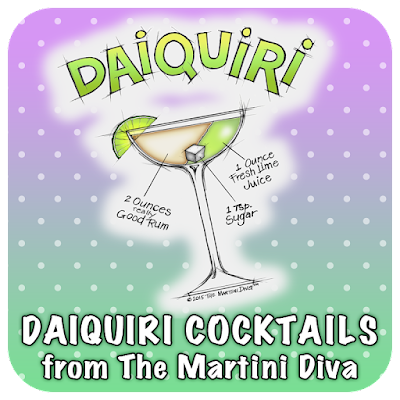 Let’s call it the Daiquiri!' And so it was christened." 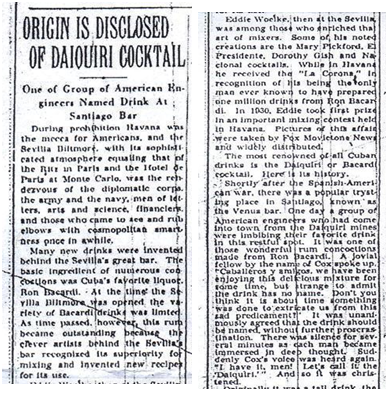 Thus starts the tale of the Daiquiri, a beloved beverage of presidents and paupers, authors and aristocrats, movie stars, miners and mariners. 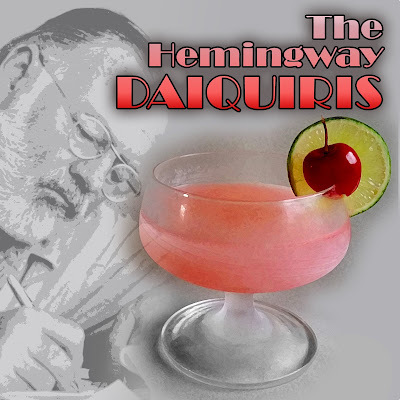 The Daiquiri is a simple drink with an auspicious past. 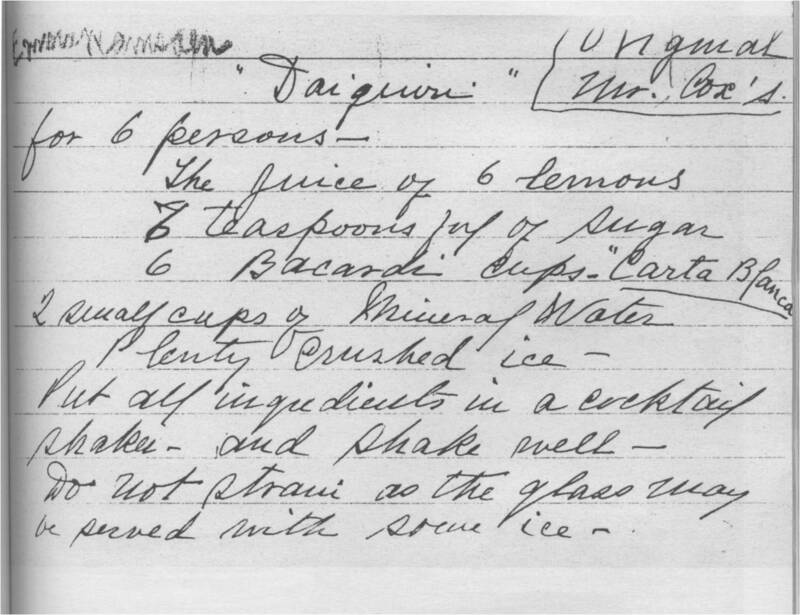 From the frozen favorites of Hemingway novels to the fruit flavored slushy renditions found in nearly every tropical vacation local to today's bespoke recipes from craft cocktail bars, the Daiquiri has endured a century of cocktail trends. 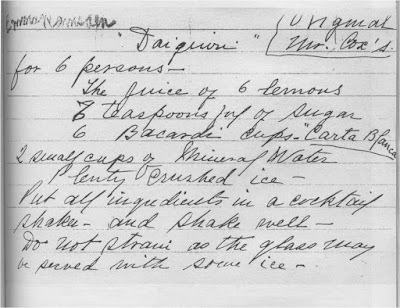 Despite being dragged through the abyss of cheap rums, defiled by sad pre-made sour mixes and being forced through frozen drink machines for the tourists and spring break crowd, the Daiquiri has managed somehow to remain a noble beverage of humble origins that lends itself to countless variations and interpretations. Below are a few of mine. 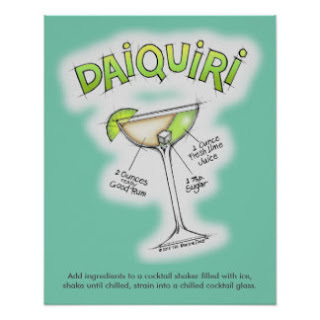 FYI: National Daiquiri Day is celebrated yearly on July 19th. * Grog was originally made with water or a weak beer and rum with the lime being added later to keep the drink fresh, it had the added benefit of acting as a preventative for scurvy. I love taking advantage of seasonal ingredients in my cocktails, it's a great way to bring freshness and intense flavors to happy hour. 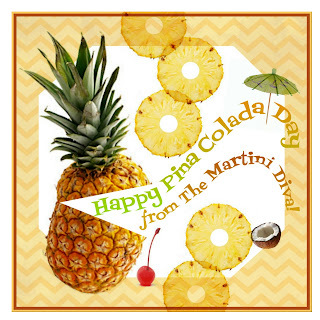 It's also a way to bring healthy to happy hour, something that's a large part of my cocktail mission. 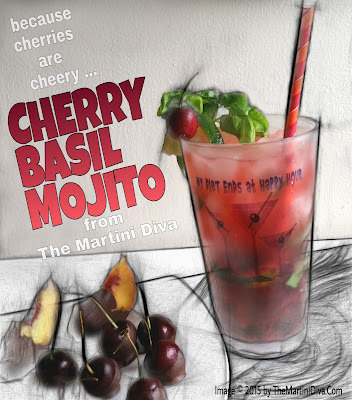 When I got my hands on some early cherries and some beautiful peaches all I could think of was muddling them in a glass and splashing booze all over them. Everyone else might be thinking pies or fruit salad, but not me, I make a beeline to the bar. 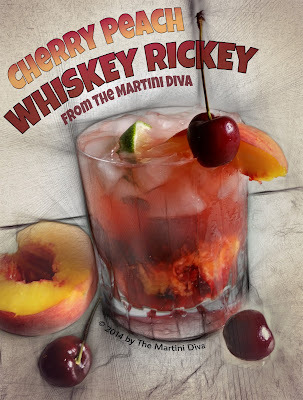 DIRECTIONS: In an Old Fashioned Glass, muddle the cherries and the peaches with the brown sugar and the lime juice. Add the whiskey/bourbon then fill glass with ice. 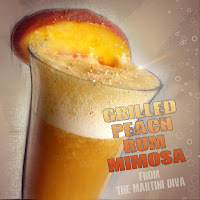 Top off with soda, stir, garnish and enjoy. I did. I made some candied pecans with my Candied Nutz and as I munched away enjoying the lovely caramelized sugar and great flavor of the toasted pecans I thought, "I wonder if I could get this flavor into a vodka infusion?" So I grabbed half a cup of the nuts before they got completely gobbled up, snagged a bottle of vodka and got to work. The results were amazing - the infusion captured both the wonderful caramelized sugar and that lovely nutty flavor that really comes out when nuts are toasted. I made one mistake, I didn't make a large enough batch the first time so I had to go through the whole process again. Don't be a dummy like me, double or even triple the recipe. Trust me, you won't be sorry. And do the same for the Candied Nutz or you'll eat them all up before you make liqueur! By the way, you can do both recipes with other nuts, like pistachios, cashews and macadamias. I've also done it walnuts but I switched out the vodka for bourbon and used maple syrup instead of sugar for my Toasted Walnut Maple Bourbon. TOOLS: Blender, infusion bottle or jar, funnel, medium metal strainer, cheesecloth, coffee filters, mason jar(s). DIRECTIONS: Put the candied nuts, sugar and the vodka into a food processor or blender and hit pulse about 5 or 6 times. Don't grind the nuts too small. Pour this mixture through the funnel into a clean infusion bottle or mason jar. Label and put it in the fridge to distill, shaking at least once a day. Check the flavor every few days until you get the flavor strength and mellowness you want. (Mine took about a week before I couldn't resist having a glass but it really hit peak at about a month.) Strain the liqueur to remove all the bits of pecan from the infusion. I used a large metal strainer for the first step, then, to get rid of the finer particles, I strained twice more, once through cheesecloth and finally through coffee filters. P.S. Don't throw away the strained out pecans, they're great as a dessert topping. 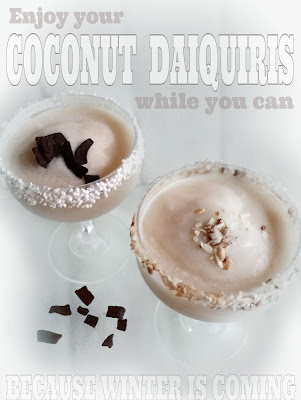 Now you get to try it out in all my great PECAN COCKTAILS! 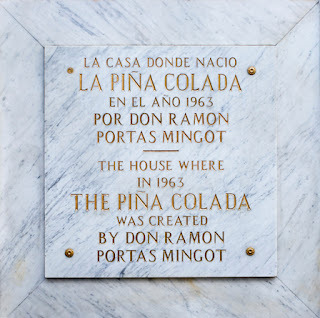 A Mojito is a classic Cuban beverage made with white rum, sugar (traditionally sugar cane juice), lime juice, sparkling water and mint. 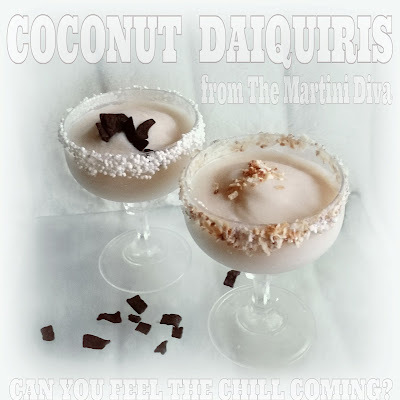 It's a tall, lightly alcoholic drink perfect for warm climates and hot summer nights. Though a Mojito is typically made with white rum, I happened to have a gift of a bottle of Diplomático Reserva Exclusiva Rum sent to me from Venezuelan distillers Destilerías Unidas S.A. This rum had a dark, caramelized, almost whiskey-like oakiness that called out to me for a tart but sweet, flirty fruit partner to soften up and round out the Mojito's bite of lime. There on my counter was a ripe pineapple just waiting to be introduced to that rum. Add a bit of smoky heat to that pineapple to accentuate the brown sugar of the rich rum and cocktail magic was bound to happen. So that's just what I did, I grilled up some pineapple to muddle in the drink, used the juice from some of the fresh pineapple and reduced it to a simple syrup (in place of the sugar) and garnished with a grilled pineapple wedge. 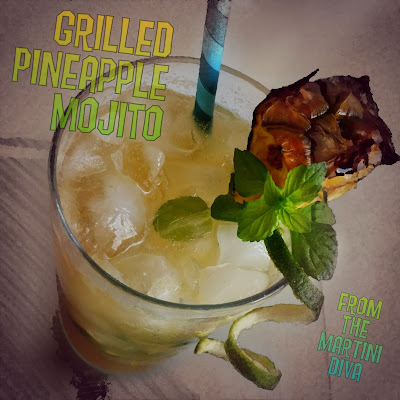 It was all about that fresh grilled pineapple and that beautiful rum being kissed by mint and having a sparkling relationship in my glass! DIRECTIONS: Make your Pineapple Simple Syrup. (Recipe below.) Grill slices from your fresh pineapple and also some wedges for the garnish. When the pineapple is cooled, cube up the slices for your drink. 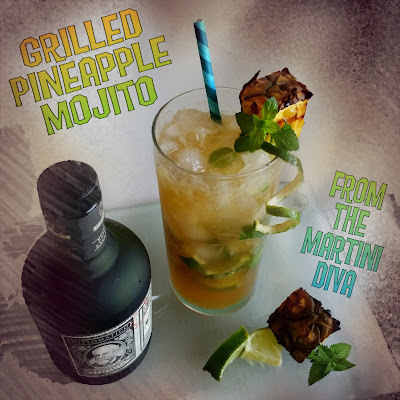 Add the grilled pineapple cubes and pineapple simple syrup to your mixing glass and muddle well to release the juices of the pineapple cubes. Create a spiral from a lime with a channel knife and set aside. In your Highball glass add the mint and lime juice and gently muddle to release the mint oils. Strain in the pineapple juice from the mixing glass, add the rum and stir. Fill this glass with crushed ice. 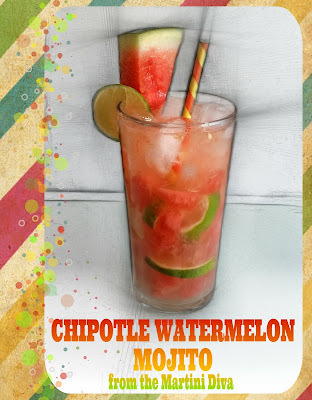 Top with the soda and garnish. Bring the sugar and pineapple juice to a boil in a medium saucepan, stirring just until sugar dissolves. Reduce volume by half. Remove from heat and allow to cool. Transfer to a clean jar. You can refrigerate unused portions for up to 3 months. 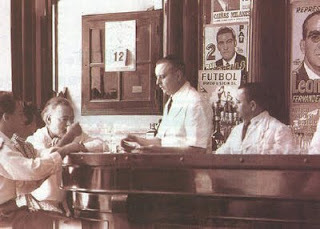 Salud, and don't forget to splash a bit of your Mojito on the floor for the saints! 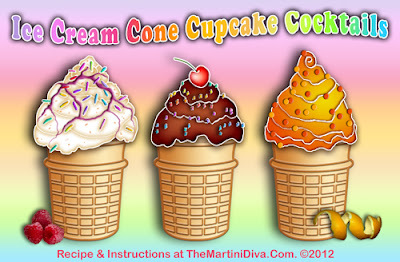 These alcohol infused ice cream cone cupcakes are really easy. I've used just a simple boxed cake mix and packaged frosting and simply added a few "extras" to them - including a nice little shot of booze. You can even add more booze by mixing some in with the frosting mixture and adding a little confectioner's sugar to thicken it up if necessary. The nice thing about infusing the alcohol AFTER the baking process is 1.) 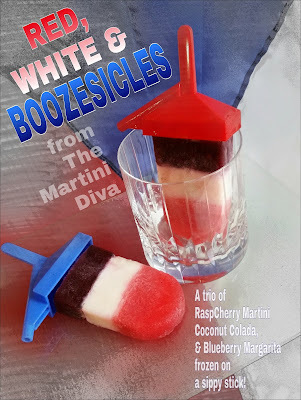 None of the alcohol bakes off, making these a true cocktail cupcake and 2.) You don't have to do all the cupcakes in a batch the same flavors. AND, yes, this method works for regular cupcakes and mini cupcakes as well, in fact, this method works for all cakes! INSTRUCTIONS: Place your ice cream cones into the muffin tins and wrapped coiled aluminum around the base to keep them from tipping over while filling and baking. Preheat your oven to 350 degrees. Prepare your cake mix as instructed on the package then fill the ice cream cups only half way. Carefully place the cone laden muffin tin into the oven.Bake for 15 to 20 minutes or until a bamboo skewer comes out clean. Allow cupcakes to cool. While cupcakes cool prepare your frosting by mixing in the orange zest. Once the cupcakes are cool take the bamboo skewer and poke about 10 holes into each cupcake cone, being careful not to poke completely to the bottom of the cone. Slowly and carefully drizzle the Chambord into the holes. Do not pour in too much or it will soak to the bottom and create a soggy cone! Pipe the frosting onto your cupcakes, drizzle on a bit more of the Chambord onto the frosting, decorate with some fresh raspberries and cute cake decorations. Try other flavor combinations like: Lemon cake with lemon zested frosting and drizzled with Limoncello. Chocolate cake with chocolate cream cheese frosting and drizzled with a home made chocolate liqueur. Orange cake with lime zested frosting and drizzled with Cointreau, Oranecello or Grand Marnier. Add some chocolate chips to the cake batter or toss in some rainbow confetti cake decorations. You can also combine the fruits and chocolate or try spice cake with banana liqueur and some candied nuts on top. The possibilities are as endless as the kinds of cakes and liquors that are available. 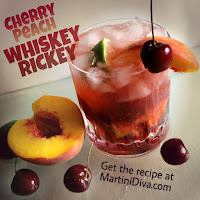 You can even create some inspired by any one of my cocktail recipes here on MartiniDiva.com, just type your chosen flavors or ingredients into the search bar and see what comes up! BTW, July is National Ice Cream Month! 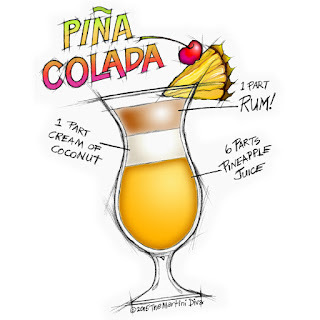 The whole time I was concocting this Pina Colada Cocktail Gel I kept hearing The Pina Colada Song (aka Escape) by Rupert Holmes. 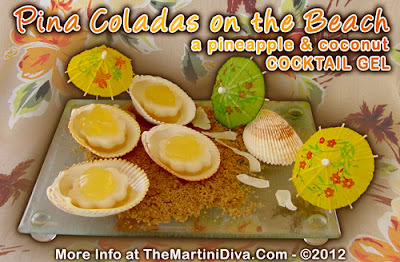 By the time I had finished my upscale Pina Colada jello shots I was definitely ready for some on the beach so I created an entire beach scene for my presentation. 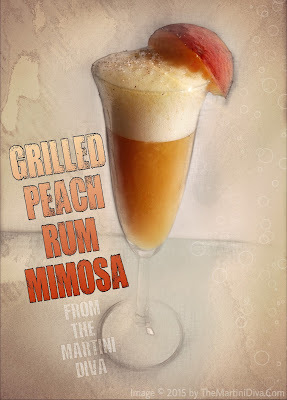 FYI, I had 4 of these the day I made them! 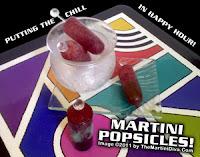 They were really delicious and refreshing, perfect for a hot day and I was feeling pretty well buzzed after three - but I ate the fourth one anyway! 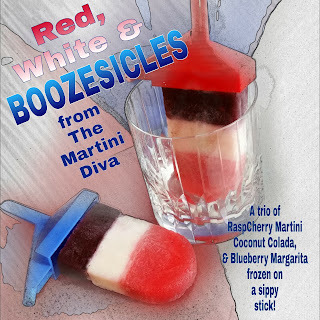 You have to be careful with these - you can eat them like candy but never forget they're loaded with booze! 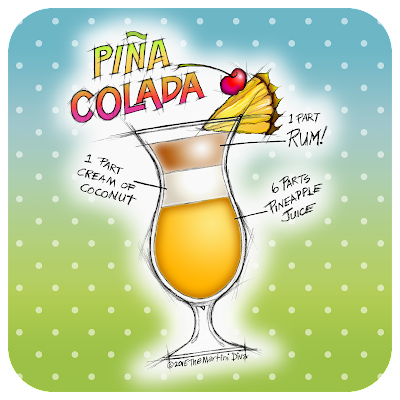 SPECIAL INSTRUCTIONS FOR PINA COLADA GELS: You will prepare the coconut and pineapple layers separately on this Pina Colada Cocktail Gel. Start with the pineapple layer first and do the coconut layer last. 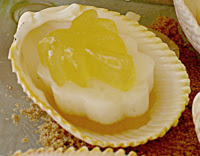 Save enough of the pineapple gelatin to pour some into your seashell mold. 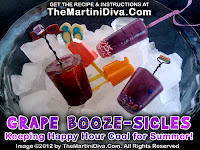 BASIC EDIBLE COCKTAIL GEL DIRECTIONS: Spray all your molds with cooking spray and set aside. Measure out all your ingredients and get your tools ready. Pour your non- alcoholic liquid (juice, water, puree, milks, creams, etc.) into your saucepan, stir well and let this sit for a few minutes. Place the saucepan on a burner, turn the heat to low and warm the mixture, stirring constantly, until the gelatin is completely dissolved. This takes about 2 to 4 minutes. Do not boil, it's not necessary. Remove the pan from the burner and, if the recipe calls for a package of dessert gelatin, stir it in. Next, quickly stir in your alcohol ingredient. Pour gelatin mixture immediately into whatever mold(s) you plan on using. Place in the refrigerator to set for at least an hour. You can then pour on additional layers, if any. 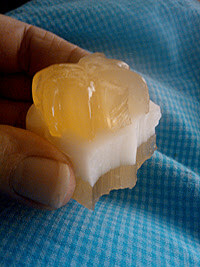 Once all layers are set, you are ready cut, press out with a cookie cutter and/or release the elements of your cocktail gels and plate. 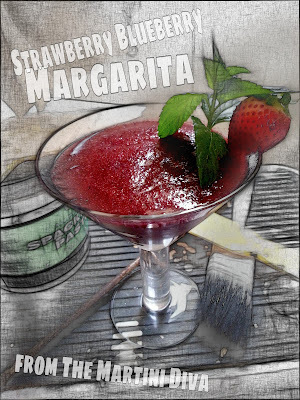 Here's a great version of a margarita that I blended up to use some leftover berries I had in the fridge. With a couple shots of tequila, those berries were just enough for a couple of delicious cocktails and a perfect end to a long day of painting and remodeling my studio. Toss it all in a blender, pulse, pour and garnish with a strawberry and sprig of mint and enjoy! 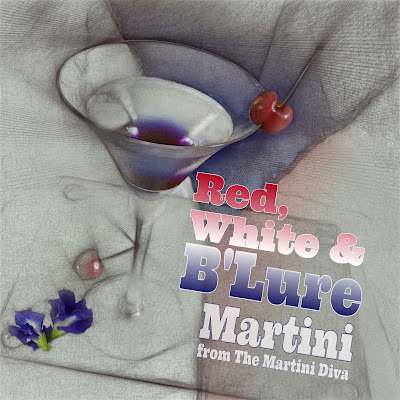 Just for kicks, it being Independence Day and all, I thought a red, white and blue martini might be fun. Blue is a hard color to come by in cocktails unless you use an artificially colored liquor, but I happened to have on hand a bottle of B'lure Butterfly Pea Flower Extract, sent to me by Wild Hibiscus, that is a naturally occuring deep blue color. I'd been dying to play with this and I finally saw an opportunity. 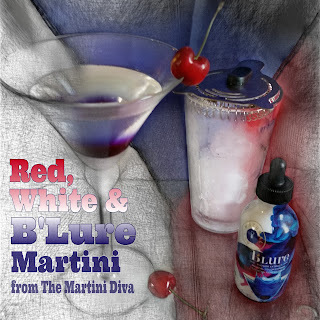 You have to be careful with B'lure if you want to maintain the blue color, because if you add any acidic element to your cocktail the B'lure will immediately start to turn from blue to pink to purple depending on how much acid you add. That's cool too, and something I want to play with more down the road, but for a July 4th theme I needed that blue. I also needed the cocktail itself to be completely clear before adding the B'lure drops. That pretty much meant clear booze all around. 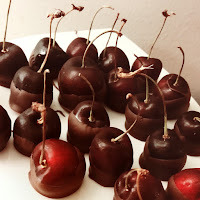 Because the butterfly pea flower extract has sugar in it and has a mild floral essence, I went with cherry vodka and Maraschino liqueur then used regular vodka and chocolate bitters to balance their sweetness. 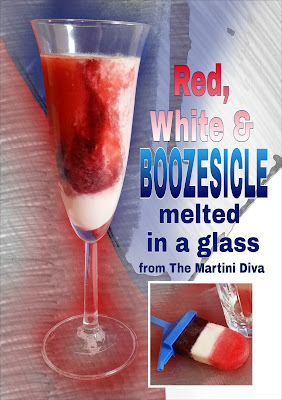 Yes, it's a powerful martini but it's meant to be sipped as you watch the fireworks and you need something with some bang for that! 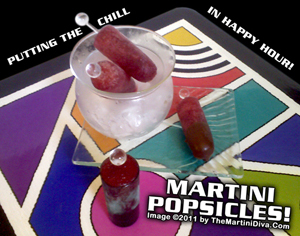 Fill your mixing glass with ice. Pour in the vodkas, the Maraschino liqueur and add the chocolate bitters. Stir rapidly with the bar spoon until well chilled. Strain into your chilled glass. Using the dropper provided, drop the Butterfly Pea Extract into the cocktail. It will settle nicely on the bottom for a layered effect. 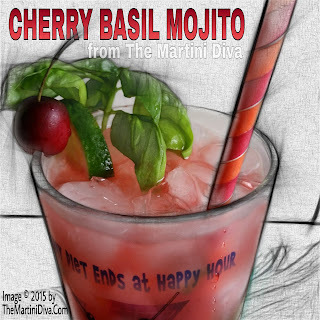 Garnish with a Maraschino cherry and enjoy. Happy 4th! 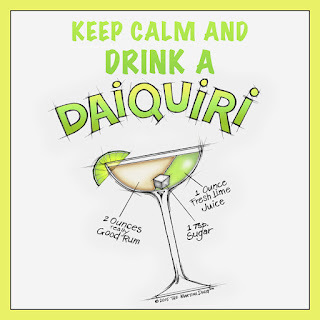 HAVE FUN, BE SAFE, DRINK RESPONSIBLY!